Emerson Clark checks a box on her college financial aid application saying she is Bloodkin and her life is changed forever. College tuition paid for, job secured, and security at all times. Years later, she is a mediator on a case between two Bloodkin families about some remains that were found, and who they belong to. The mediator must be Bloodkin, and even though still skeptical about this Bloodkin thing, she accepts the job. She was actually a pretty funny character to read. She didn’t have any fear of these dragons because she thought it was all made up. As she mediates, she thinks they are just rich people playing some weird role playing game. Dragons weren’t real! Thane Ealdian was close to the end of his life, his dragon very close to the surface. 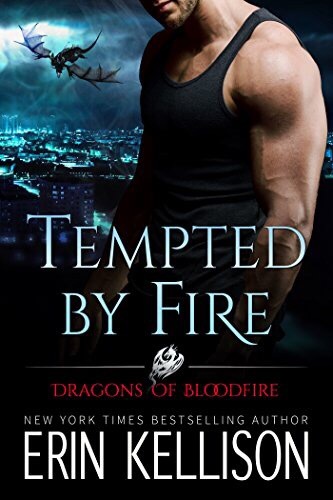 When he meets Emerson, his dragon is intrigued and he enlists her aid in finding out who killed his wife and child, the centuries old remains that were found. I thought this was a good introduction to Erin Kellison’s Bloodkin world. I was a newcomer and saw this world through Emerson’s eyes. Discovering this world right alongside her. Her skepticism would’ve been my own as well, and her voice was realistic. She and Thane had some great chemistry, and I liked how he was wise versus her naïveté, giving the reader a view of the same world but from different perspectives. If you are interested in dragon shifters and a good mystery, then pick up this book and give it a try. I was intrigued enough that I purchased the second in the series!